If your Hub has a solid yellow light and has stopped offering puzzles, it's time to refill the food pod! You can add food by lifting the hatch on the side of the Hub - the one with the CleverPet logo on it! Then open the orange silicone door, and dispense food into the food pod. When you're done, make sure the orange door is completely sealed, and then close the hatch. You then need to signal to the Hub that food has been added. 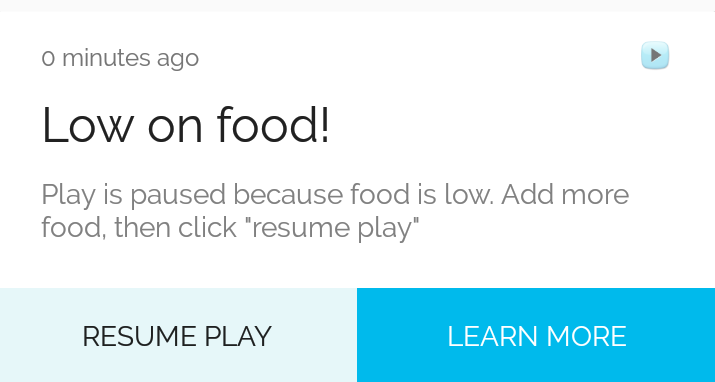 Click the "resume play" button in your app to tell your Hub to check for food again. If you don't have your app open, you can also tell the Hub to check for food by lifting the dome using the orange latches at the back of your Hub. Then lower the dome so it clicks into place. The indicator light will then return to white, and the Hub will resume gameplay where your pup left off! I already refilled my Hub, but it's still telling me it's out of food. What's going on? First, make sure that you've either clicked "resume play" in your app, or lifted the dome and snapped it back into place, as shown above. Also make sure that you haven't put too much food in the Hub, and that the food you're using isn't too big or sticky. The Hub determines that it's low on food by attempting to dispense food a few times, so if any food is getting stuck in the dispenser, the Hub may think it's empty. Not sure if your food is compatible with the Hub? Read more here.